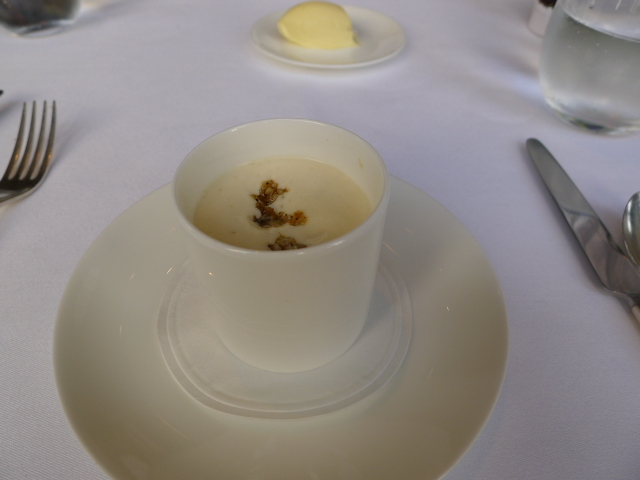 The amuse bouche was a cauliflower foam with curried lentils and topped with cauliflower crisps. This was deliciously creamy if a little salty. The crunchiness coming through from the crisps were also delightful. 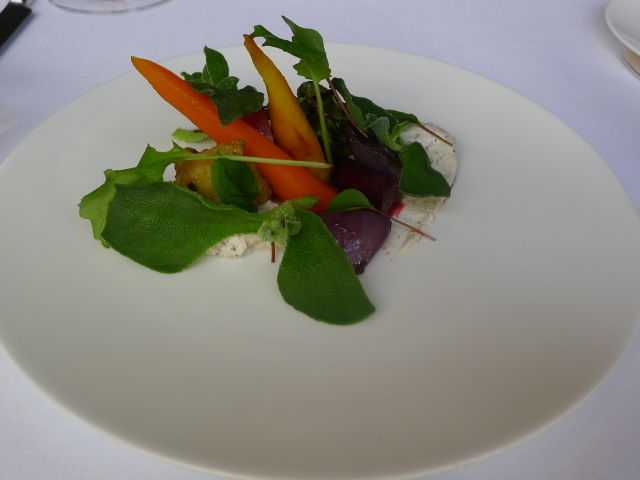 Our first starter was a winter vegetable salad with truffle cream cheese, pickled carrots, salt baked vegetables and a grain mustard and honey. The vegetables were perfectly cooked and gave way to a bit of bite. The dressing was lovely and the aromatic cream cheese worked well with the vegetables. 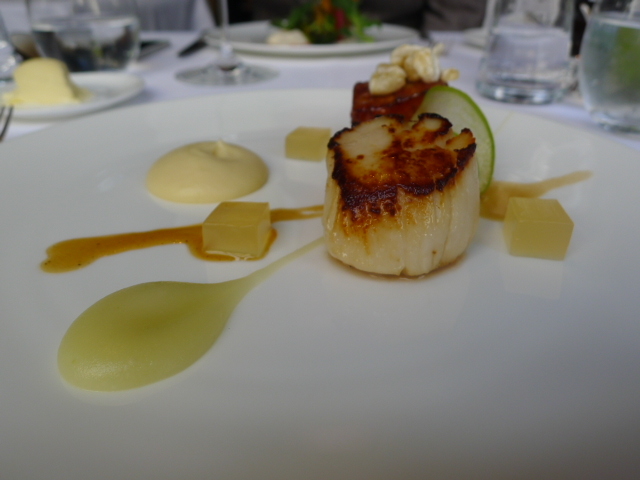 An Orkney scallop with glazed pork belly, apple, celeriac and celery leaf (at £6 supplement) was sweet and succulent. The apple puree was wonderful and gave this dish a gentle sweetness. The pork was also tasty and moist. However there was some exploding pig’s skin on the dish which seemed superfluous, and if anything, detracted from the dish. The cod in a main of Cornish cod with mussels a la plancha, salted cod brandade, and flat leaf parsley was nicely cooked and well-seasoned. But the mussels were bland and it was difficult to detect the flavour coming through from the salted cod. 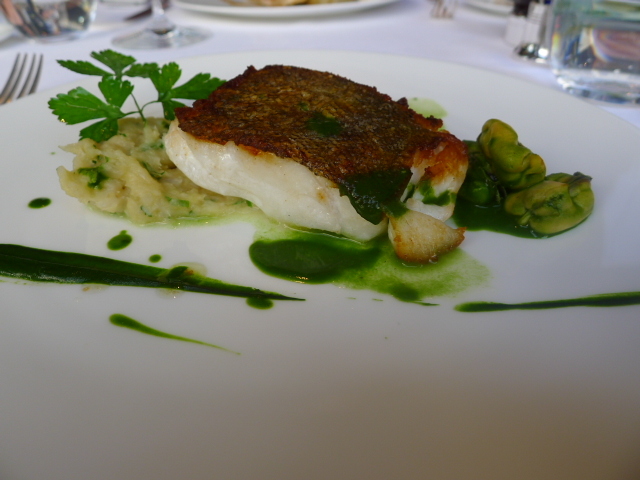 As for the flat leaf parsley puree, this proved to be terrible. Instead of fragrance and aroma, what one got was an intensely concentrated parsley flavour that was too strong against the delicacy of the fish. This dish did not work. 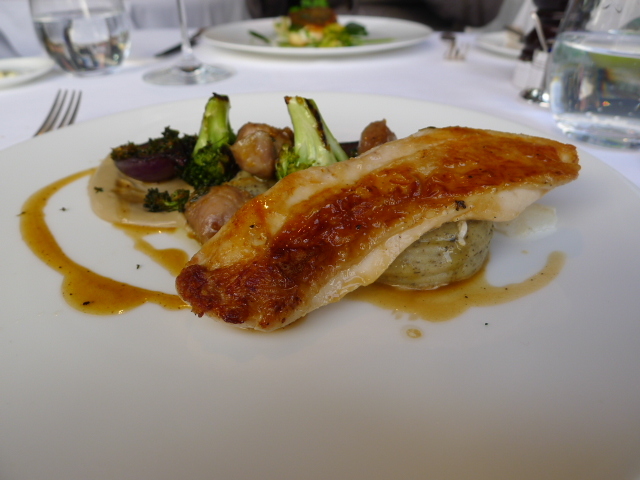 Rhug Estate organic chicken served with truffle mash, tenderstem broccoli and roasted chicken jus proved to be a satisfying dish. The chicken was nicely cooked and both the jus and the mash were lovely. There was nothing groundbreaking about this dish, but it was tasty and enjoyable nevertheless. The breads of white sourdough and wholemeal were average and somewhat disappointingly. The crusts weren’t crunchy as one would expect of good bread, and the sourdough lacked for a slightly springy touch. Furthermore, there wasn’t enough flavour coming through from the bread. 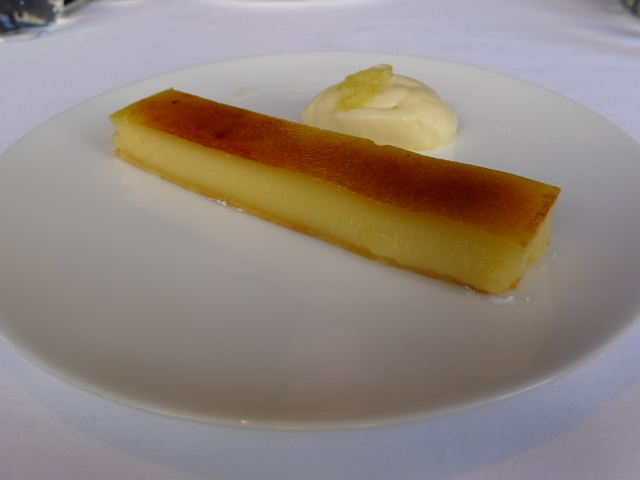 To the desserts, and a lemon tart with confit lemon and iced lemon curd was nice and zingy. But the pastry base let the side down slightly as it could have been firmer and shorter. A deconstructed English custard tart scented with vanilla, and served with roasted cox apple, warm puff pastry and apple ice cream was as pretty as a picture. But it was an uninspired dessert with the pastry being a little dry, the apple being hard and underdone, and the custard lacking depth. 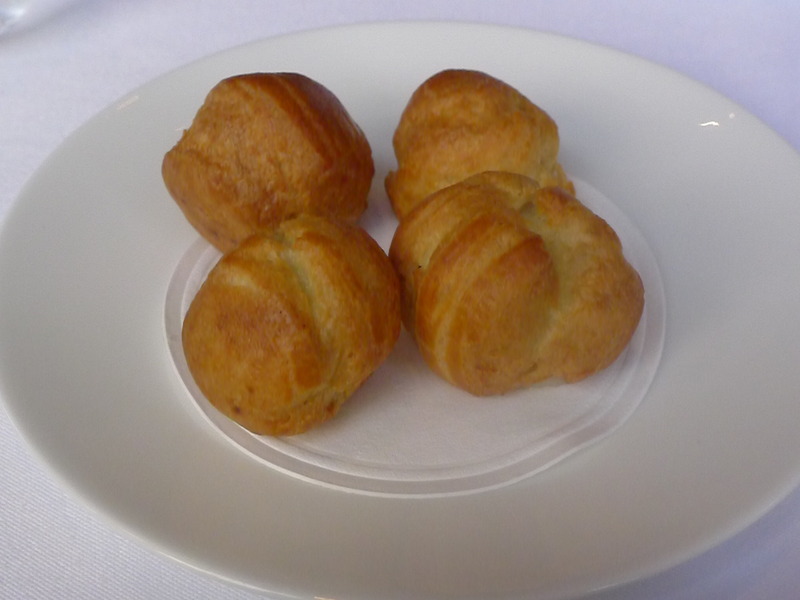 As a complete dessert, it was conceptually clever but lacking in substance. 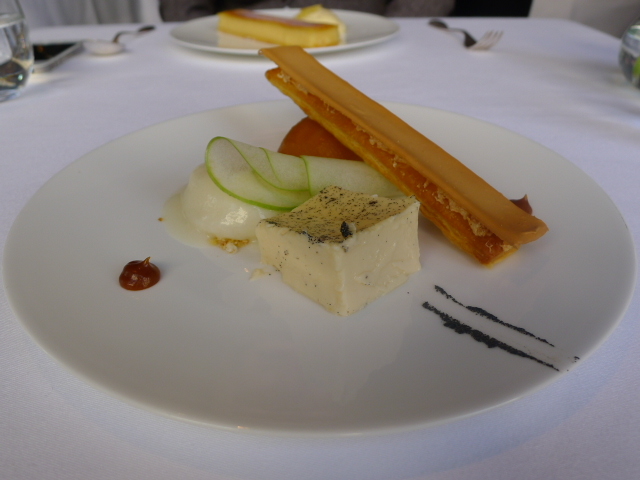 There were nice touches throughout the meal and the presentation was consistent with what one would expect from a Michelin-Starred chef, although from a Michelin perspective, the cooking didn’t always hit the mark. 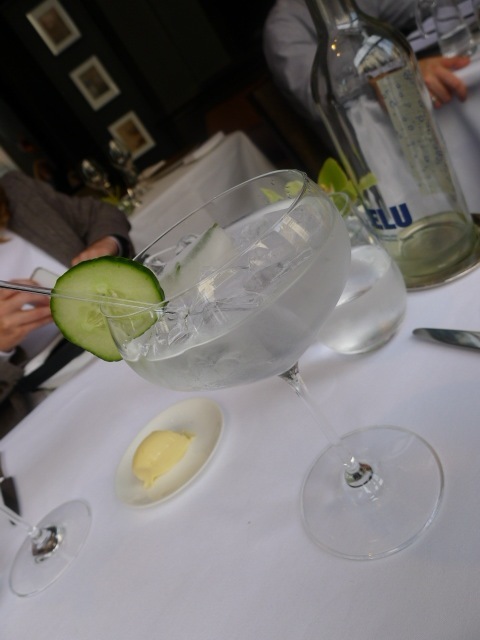 The food was really decent and reasonably priced, and value for money wise there were no complaints. Given the price points charged, this was a fair meal. However it would be difficult to critique the full Michelin dinner experience based on this smaller lunch time menu.